Music Links Internet Radio and on The Airwaves! Driving on The Left Side !!!!!!!! "UPCOMING PERFORMANCES SUMMER 2005" "Driving on The Left Side"by Blackbird Productions ,an upcoming New Jamaican Play.We will be in this production as the House Band.Please visit the site. 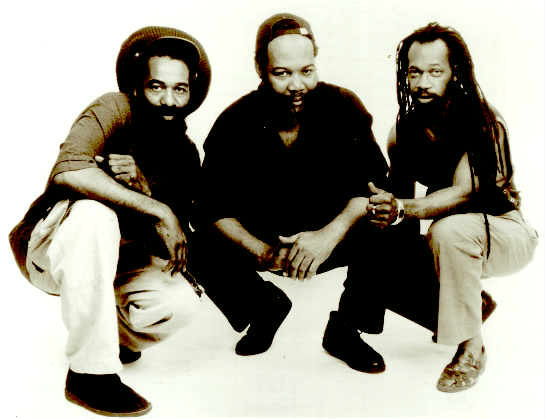 Stephen's Talk House In The Hamptons"
"Listen to MP3 "Don't Give Up"
Bearing a wealth of experience bubbling enthusiasm and solid commitment to both the message and the music, the members of the aspiring reggae group, �REGGAELUTION�, are about to change the world. REGGAELUTION�s repertoire includes a CD entitled, �LOVE AFAIR�, and singles entitled, �SING A LITTLE SONG�, on REGGAELUTION RECORDS, and �DON�T GIVE UP�. The CD "Don't Give Up"
REGGAELUTION created it�s first video, �ROCK to REGGAELUTION�. Aired on popular cable networks such as BCAT and Caribbean Billboards. The group was also featured in their debut movie, �AMERICAN LOVE STORY �, a ten �series documentary produced by JENNIFER FOLK and MTV Real Works. It was aired on American Playhouse, PBS Channel 13. Occasionally, its musical output is spiced with cover versions of solid gold hits. Yet, the group does enjoy writing it�s own music. Songs on the CD address issues of Culture, Intimacy, Celebration and Thanksgiving. In these songs, the group is able to maintain the traditional Roots Reggae sound while embracing contemporary dance hall and other Caribbean forms. �REGGAELUTION�-Not to be mistaken for Revolution�Simply means �The Unchanged Love Beat.� This love beats within our hearts, our minds, and out total being. It is the Love we have for our families, our communities, our world, and ourselves. The love that truly ties us together as One! REGGAELUTION takes a firm stand with love for all, without condition. As we are in this new millennium, Reggaelution, through its pulsating Roots Reggae beats and conscious messages, invites you to be a part of our team in encouraging and spreading the �LOVE BEAT�, worldwide. What is at stake is the one perfect love at its Highest form, for all of US! � Copyright 2002, Tony Rankin Productions, Inc. All Rights Reserved. Tony Rankin� is a registered trademark of Tony Rankin International.